Just north of Sarasota in Manatee county is the town of Bradenton, Florida. Bradenton offers many beautiful beaches, fine restaurants and shopping. With lower real estate prices, many of the hotel rates are lower in Bradenton as well. For Ellenton hotels, click here. BridgeWalk, a landmark resort offers 28 spacious apartment-style accommodations in the historic district of Bradenton Beach, located on Anna Maria Island, Florida. Accommodation offerings range from 460-1,660 square feet including large, private, screened verandas and featuring Jacuzzi tubs*, mini or full kitchens. Two bedroom town homes also have fireplaces. *exception, studio suites in the Queen Palm Building. The Tortuga Inn, located on Quaint Anna Maria Island, offers that rare combination of luxurious accommodations and old Florida charm. Lush tropical gardens surround the Spanish colonial style buildings, which have private courtyards and balconies, Mexican tiled floors and red-tiled roofs. Relax on the private sugar-sand beach on the Gulf Of Mexico or by the fountain-fed swimming pool. The bayfront docks are perfect for fishing and boating. Also on site are barbeque grills, laundry facilities, a small meeting room and complimentary parking. So for all you beach lovers, fishermen, boaters, honeymooners, families, friends or anyone else seeking a laid-back vacation in romantic tropical surroundings, take note: Tortuga Inn on Anna Maria Island is the perfect destination for you! The Silver Surf Gulf Beach Resort on Anna Maria Island is located 5 minutes from the Bridge Street Pier. This is a great spot to fish for grouper, flounder, mullet, bluefish, and ladyfish. Deep sea fishing is also available through a number of fishing charter companies in the area. Silver Surf Gulf Beach Resort offers resort rooms, studio suites, studios*, and gulf studios*. The studio suites include mini refrigerators, microwaves, and coffee makers. Accommodations are spacious and the gulf studios include a screened lanai facing the beach. Most of the accommodation offerings have a view of the Gulf of Mexico and the beach. Resort amenities: private white sandy beach access, heated pool, chaise lounges and umbrellas, boat parking, beach volleyball, shuffleboard, picnic area with grills, daily maid service and laundry facilities. Courtyard By Marriott Bradenton Sarasota Riverfront has an outdoor pool, a spa tub, and a fitness facility. Business amenities at this 3.0-star property include a business center, wireless internet access, meeting rooms for small groups, and business services. The Property has a restaurant and a bar/lounge. Room service is available during limited hours. 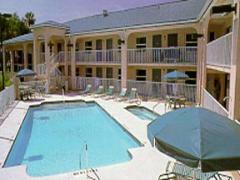 Best Western Atrea Manatee Hotel has an outdoor pool and a fitness facility. Business amenities include a 24-hour business center, complimentary wireless internet access, meeting rooms for small groups, and business services. Best Western Atrea Manatee Hotel has a coffee shop/café. Guests are served a complimentary breakfast each morning. Event facilities include conference rooms. Guest parking is complimentary. 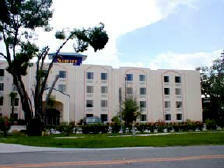 The Comfort Suites University Park is a first-class hotel located six miles from Sarasota-Bradenton Airport. This excellent property is a great hotel that offers its guests plenty of reasons to stay here. Beautifully appointed guest rooms create an air of tranquility. The rooms are spacious, comfortable and the perfect place to relax after a long day of sightseeing, shopping or business. Each of the rooms are equipped with the modern amenities today's travelers have come to expect. 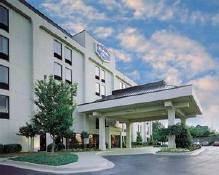 Personable and professional, the Comfort Suites University Park's well-trained staff provides outstanding hospitality. They are on call to help with any need. The hotel is close to area dining, shopping and entertainment venues. Fairfield Inn Lakewood Ranch is a first class property strategically located in the upscale Lakewood Ranch community and only 7 miles from the Sarasota Airport. Come and enjoy the hospitality of this cordial property where a free continental breakfast buffet is included in the price. This hotel offers 87 tastefully appointed guest rooms featuring exceptional amenities such as coffee service, iron and ironing boards, hair dryers, voice mail, alarm clocks and cable TV. 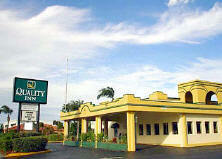 Centrally located in southwest Florida, we offer 60 rooms and suites to meet every persons needs. Our business guests will enjoy voice mail, two line phones, data ports and our award-winning complimentary continental breakfast served every morning, from 6:30am to 9:30am. The Tampa International Airport is only 30 minutes away. 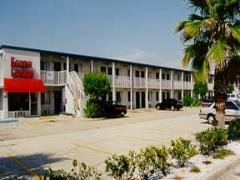 Our vacationer will enjoy our easy access to the interstate as well as restaraunts within walking distance. The pool is open from 10am to 10pm 7 days a week. Enjoy our evening "Managers Social" with complimentary cocktails and hors'derves. Holiday Inn Sarasota Airport has an indoor pool, a spa tub, a fitness facility, and a pool. Business amenities include a business center, wireless internet access, business services, and secretarial services. Holiday Inn Sarasota Airport has a restaurant and a bar/lounge. Guests are served a complimentary breakfast each morning. Additional amenities include valet parking, a concierge desk, and a grocery/convenience store. The Hotel in Bradenton maintains its small town charm offering amenities of larger cities with an absence of most of the big city problems. Manatee County and its beauty of the beaches are also home to a fledgling movie industry. A good number of movies and commercials have been filmed here. Number of rooms: 50 Number of floors: 2 Check In: 1:00 PM Check Out: 12:00 PM Amenities 24 hour front desk; In room coffee makers; Microwave & refrigerators in some rooms; Some rooms with stove/oven & refrigerators; Modem lines in rooms; Laundry service & Fax service available; Non-smoking rooms available; Free HBO, ESPN & other movie channel; Free parking; RV or Truck parking; Pets allowed in rooms; Nearby fishing, fitness center/spa, shops/commercial services; Sarasota finest attractions & beaches nearby; 3 1/2 miles to the Sarasota-Bradenton Airport. Days Inn Bradenton is conveniently located on U.S. 41, Only minutes from the Home of the Pittsburgh Pirates, Tropicana Corporate Offices, Bealls Corporate Offices and the Manatee Civic Center. Our on site Restaurant, the First Street Cafe serves a Great American menu from 6:00AM to 2:00PM. Meeting and Banquet facilities accommodate up to 125 people. We specialize in large groups and conferences. Days Inn is your economic gulf beach connection! 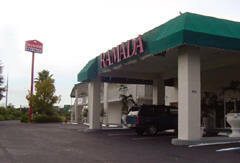 The Days Inn Bradenton I-75 offers many amenities to its guests. We have cable television, an outdoor pool, and free parking. The beach is also only 12 miles from the property. We are conveniently located off of I-75 to exit 42. Shorewalk Vacation Villas situated on a 30 acre security patrolled resort with villas overlooking 6 lakes has a lot to offer. Join other worldwide guests and enjoy vacation pleasures for the entire family including: morning coffee at our clubhouse, refreshing swims in one of our 2 outdoor swimming pools, relaxing moments in our 2 Jacuzzis, or spirited matches on our tennis courts. The Clubhouse features a Billiard Room plus a large sun deck. Within a short driving distance you can be at miles and miles of white sandy beaches, major shopping areas including 2 factory outlet malls, flea markets, historical monuments, plus national and state parks. Walking distance to restaurants. 2.5 miles to airport, 2.5 miles to Ringling Museum, 4 miles to Sarasota Jungle Gardens, 8 miles to gulf beaches. 607 - 67th St. Cir. E.
Minutes from Pittsburgh Pirates Spring Training Camp. 1 mile to shopping center and restaurants. Located 3 miles south of convention center. Minutes from beaches. Pool & spa. All rooms have queen or king beds, 25 inch TV with remote, ESPN, HBO & CNN. Non-smoking and handicap rooms available. Walk to restaurants. Beaches 6 miles. The Hampton Inn Ellenton/Bradenton is located near I-75 and adjacent to the Prime Outlet Mall. The hotel is within walking distance of J.P. Igloo skating facility. Downtown Bradenton is just 5 miles southwest and the Sarasota-Bradenton International Airport is 21 miles southwest of the hotel (Tampa International Airport is only 45 miles north). This interior corridor facility offers all the great Hampton amenities such as a complimentary breakfast bar. The guest rooms are all well-appointed and equipped with an iron, safe deposit box, voice mail, a 25" TV with cable and pay per view movies. The Hampton Inn also features an outdoor heated swimming pool. The Hampton Inn Ellenton/Bradenton is just steps to fine dining, shopping and entertainment venues. Hotel is located on the Manatee River across the street from a Prime Outlet Mall. Walking distance to great restaurants and just minutes to St. Petersburg, Tampa, Sarasota.